A continuation of last weeks post with more Constellations and Legends as well as some planets that can be seen from the Northern Hemisphere. Check this map to see how to locate Polaris, the North Star, in the Little Dipper. Polaris is the important star in this circumpolar constellation. That means it never sets in the Northern Hemisphere. Polaris also never moves from its spot in the sky. Ursa Minor was first cataloged by the Greek astronomer Ptolemy in the 2nd century. Polaris is a yellow-white supergiant. When Zeus, the supreme god of the Olympians, was small, his mother Rhea hid him on the island of Crete to protect him from his father Cronus. Two nymphs raised him. 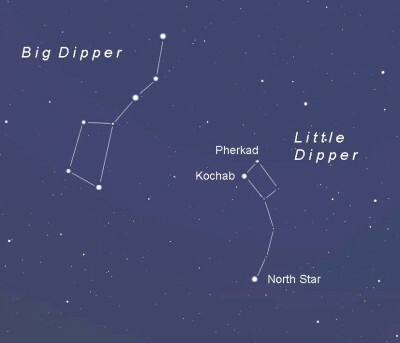 One is Ida, who is represented by the Little Dipper and the other is Adrasteia, represented by the Big Dipper. If your children should ask why Rhea had too protect Zeus, here is the rest of the story. An old prophecy said that Cronus would be overthrown by one of his children, so he swallowed 5 of his children (Poseidon, Hades, Hera, Hestian and Demeter) When Zeus grew up, he fulfilled the prophecy and freed his siblings. He then became the supreme god. Another Greek legend says that Arcturs is identified with Arcas, son of Zeus and Callisto. He was raised by his maternal grandfather, King Lycaon. One day, Zeus paid a visit and had a meal with Lycaon. King Lycaon had seized the boy and cut him into pieces and then served him to Zeus for the meal. Lycaon didn’t really believe that Zeus was really Zeus, so this was a test. Lycaon challenged Zeus to turn the pieces back into his son, Arcas. Zeus was ferious and after bringing his son back to life, he changed King Lycaon into a werewolf, (the beginning of Lycanthropy). Arcas became King of Arcadia and was a great hunter, particularly of wolves. Arcus didn’t know that Hera, the wife of Zeus, had turned his mother, Callisto into a bear. He was out hunting when he met up with a bear who was really his mother. Zeus stopped Arcus from killing the bear and placed them both in the heavens. 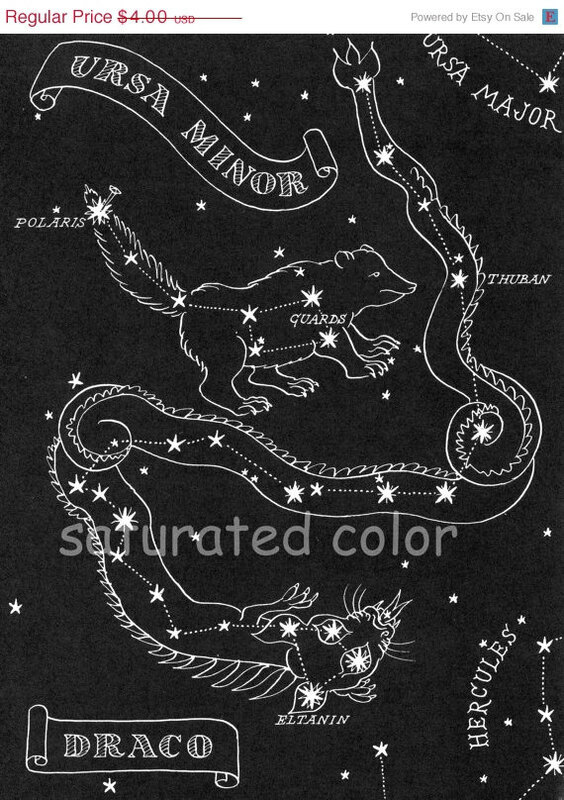 Callisto became Ursa Major (the Great Bear) and Arus became Ursa Minor (the Little Bear). Classical Old World mythology is replete with the bear in its role as Ursa Major and Minor. Ancient Greek, Hebrew, and Arabic all contain references to this motif. A Paiute Legend (Native North American): can be read here. 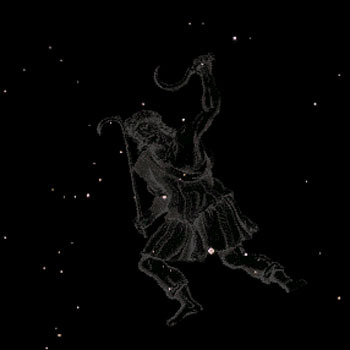 In Hungarian mythology the constellation is called ‘Little Goncol cart’ (Göncöl szekér) after a legendary shaman. (Ursa Major is ‘Big Goncol cart.’) The shaman’s knowledge knew no limit. He invented the cart: His nation was wandering, so the cart was the biggest gift of the Gods to the country. Legends claim he knew everything about the world. Nobody saw his death; his body simply disappeared among the stars. Kvennavagn,” means woman’s chariot and is Little Dipper in the Norse language. ”Karlvagn,” means man’s chariot and is the Big dipper. This means that Thor might be the Man and Freya the woman, both traveling by chariots according to the myths. Thor is the god of storms and thunder. Freya is a goddess of love, beauty, fertility, war and death. For the Greeks: Ursa Minor was the Little Bear of Heaven. In China: it was seen as a wagon. In England: it is seen as a plough (plow). Some Arabs: see it as animals in a field. Some Native North American Peoples: it is seen as hunters chasing animals. Another important use for constellations was navigation. Many seafaring cultures used the North Star (Polaris) as a guide. Using the height of the North Star in the sky, navigators could figure out their latitude helping ships to travel across the oceans. The Inuit called the North Star, Never Moves. Nuuttuittuq is the North Star Polaris, the star that never moves. There is a beautiful Native American legend which tells a story of a group of hunters who got lost in the forest. They prayed to the spirits to send them help to find their way home. Suddenly a small girl appeared to the hunters and said she was the spirit of the pole star. She led them home after which, the star. Polaris was known as the star that does not move. When they died the hunters were placed into the sky where they forever follow the pole star. Bootes (pronounced boo-oh-tees) is usually represented as a hunter, herdsman or shepherd.He has been represented in cave paintings depicting successful hunts. Bootes is a Greek word that means, Noisy. Herders shout to the animals they are herding. 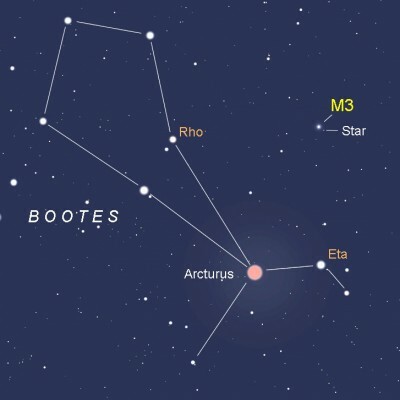 The brightest star in this constellation is Arcturus. It is the fourth brightest star seen from earth (outshone only by Sirius, Canopus and Alpha Centauri) It is an orange giant whose end is near. It can be seen in the Northern Hemisphere in the early evening beginning in March. Arcturus is also a Greek word that means, Keeper of the Bear. 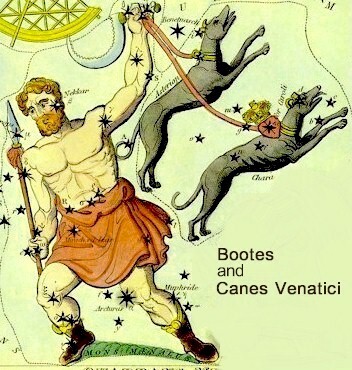 This constellation is near Ursa Major, so to the Greeks, Bootes was the “Watcher or Guardian”. Homer, in his novel the Odyssey, called Bootes the Bear Driver. the Arabs called Bootes the Lance Bearer and Keeper of Heaven. It was mentioned in the Hebrew Bible in Job, so is often refereed to as Job’s Star. Bootes was the son of Demeter. She was the goddess of agriculture. He invented the plough to support himself by tilling the soil. In honour of his service to mankind, he was placed in the sky, near Ursa Major, which is sometimes seen as a plough. Another Greek legend says that Bootes is identified with Arcas, son of Zeus and Callisto. This story is told in the previous section, Little Dipper. Arcturus was called Dagstjarna, Day star. Day star you say? (The Finnish name for Arcturus is “Aurinkontähti”, sunstar) At the latitudes of Scandinavia, especially around the Arctic Circle, the sunrise follows star time during the first months of the year. So an intense star visible before sunrise during late winter and spring will indicate that the sun is coming and be referred to as the day star, Arcturus. Arcturus is also called Day Star in some parts of Norway today. Most cultures associate the star Arcturus with Ursa Major. It follows behind the Dipper, Wagon, Bear, Animals, at a safe distance as if driving or herding, guarding, tending or hunting, depending on which culture. In ancient China, Bootes is a ploughman of celestial fields. The ancient Egyptians called Bootes, Smat. It means, One who Rules, subdues and governs. He was also called Bau, The Coming One. Wow! What a great month for planets! Watch Venus, Mars and Jupiter pop out at nightfall. Jupiter opposition February 6. Venus/Mars conjunction February 21. Mercury and Saturn before dawn. 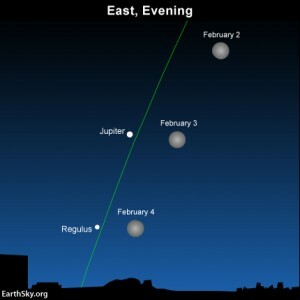 Bright Jupiter in east at nightfall, then out all night At opposition to the sun on February 6, Jupiter enjoys its month of glory in February 2015. What is opposition? It simply means that Earth passes between Jupiter and the sun on this date, as we do every year. It means Jupiter is opposite the sun in our sky – at its best! Around the time of opposition, Earth is closest to Jupiter. The distance between our two worlds is least. Jupiter, in turn, shines at its brightest and best in Earth’s nighttime sky – brighter than it will again until June 2019. Once you see Jupiter over the eastern horizon at dusk or nightfall, it’s unmistakable. This world shines more brilliantly than any star. As evening falls, look for brilliant Venus in the west, then turn around to see Jupiter in the opposite direction: east. Jupiter is always the second-brightest planet after Venus. In February 2015, Venus sets in the west at early evening, leaving the king planet Jupiter to rule the night. Brilliant Venus in west at nightfall. Venus – brightest of all planets, and third-brightest object in the sky after the sun and moon – climbs out of the glare of evening twilight all through February 2015. It puts on a spectacular show with Mars this month! You won’t want to miss these two worlds as they edge closer on our sky’s dome for the first three weeks of February. Meanwhile, day by day, Venus will be staying out longer after dark (but still following the sun beneath the horizon by early evening). In early February, this dazzling world sets about two hours after sunset at mid-northern latitudes. The queen planet’s visibility improves throughout February, setting about two and one-half hours after the sun by the month’s end. 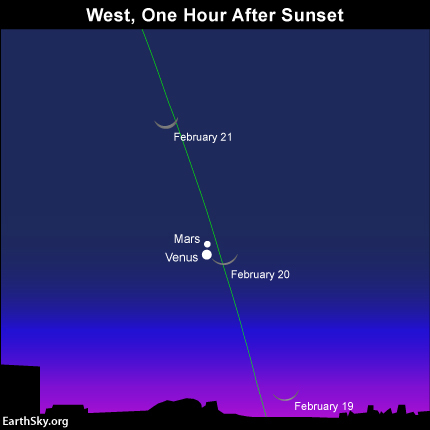 Do not miss Venus and Mars on February 19, February 20 and February 21, as the slender waxing crescent moon returns to the evening sky, and moves up past two planets in the western twilight. Find an unobstructed horizon in the direction of sunset, and bring along binoculars, if you have them, to enhance the view. 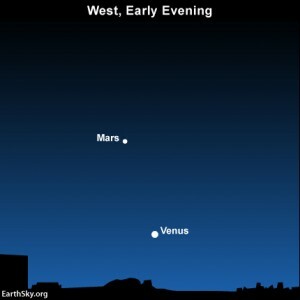 It’ll be Venus’ and Mars’ closest conjunction on our sky’s dome until October 5, 2017. It’ll be spectacular! Unforgettable. Definitely photogenic, so snag your camera before going outside if you’re so inclined. Saturn visible in February predawn. The golden planet Saturn rises in the southeast about two and one-half hours after midnight in early February and roughly one-half hour after midnight by the month’s end. 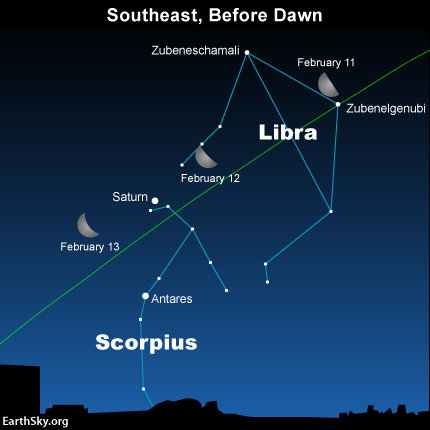 Watch for the rather wide waning crescent moon to couple up with Saturn in the predawn hours on February 12 and February 13. Binoculars don’t reveal Saturn’s gorgeous rings. For that, you need a small telescope. Saturn’s rings are inclined at about 25o from edge-on in February 2015, exhibiting their northern face. Several years from now, in October 2017, the rings will open most widely, displaying a maximum inclination of 27o. As with so much in space (and on Earth), the appearance of Saturn’s rings from Earth is cyclical. In the year 2025, the rings will appear edge-on as seen from Earth. After that, we’ll begin to see the south side of Saturn’s rings, to increase to a maximum inclination of 27o by May 2032.